McIntosh, Andrew et al. "Buffy Sainte-Marie". The Canadian Encyclopedia, 21 March 2019, Historica Canada. 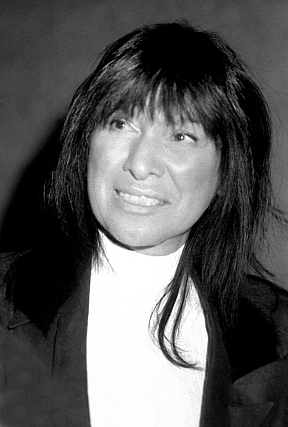 https://www.thecanadianencyclopedia.ca/en/article/buffy-sainte-marie. Accessed 21 April 2019. Beverly Sainte-Marie, OC, singer, songwriter, multi-instrumentalist, educator, social activist, philanthropist, visual artist (born 20 February 1941 on Piapot Reserve, SK). 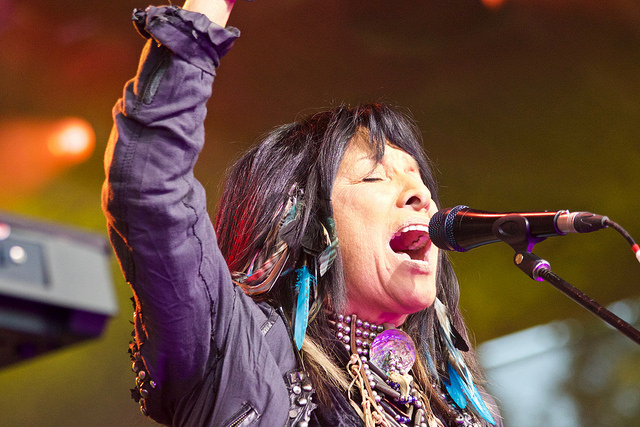 A pioneering and influential singer-songwriter, Buffy Sainte-Marie specializes in love songs and music with a political and social-activist focus. She was an important figure in the Greenwich Village and Toronto folk music revivals in the 1960s, and is perhaps best known for her 1964 anti-war anthem “Universal Soldier,” which was inducted into the Canadian Songwriters Hall of Fame in 2005. She won a Golden Globe, a BAFTA and an Academy Award for co-writing the hit song “Up Where We Belong.” An Officer of the Order of Canada, she has been inducted into the Canadian Music Hall of Fame, the Canadian Country Music Hall of Fame, the Canadian Songwriters Hall of Fame and Canada’s Walk of Fame. She has received the Polaris Music Prize and the Governor General’s Performing Arts Award, as well as multiple Juno Awards, Canadian Aboriginal Music Awards, lifetime achievement awards and honorary degrees. Buffy Sainte-Marie performs at the Canada Summer Games in Winnipeg, Manitoba, 6 August 2017. Possibly orphaned, Sainte-Marie was adopted when she was a few months old, and raised in Maine and Massachusetts by Albert Sainte-Marie and his wife, Winifred, who was part Mi’kmaq. Sainte-Marie graduated with honours in Oriental philosophy and education from the University of Massachusetts, Amherst in 1963. She moved to New York City to try her luck as a songwriter, and made a name for herself performing musically in Greenwich Village, which soon led to playing around the world at folk festivals, coffee houses, concert venues and in Indigenous communities. During this period she returned to the Piapot Reserve in Saskatchewan’s Qu’Appelle River Valley, where she was adopted according to tribal custom by Emile Piapot and his wife, Clara Starblanket Piapot, a Cree family believed to be related to her biological parents, whom she never knew. Sainte-Marie signed with Vanguard Records, which released It’s My Way! in 1964. The album included “Universal Soldier,” a song that Sainte-Marie has said is “about individual responsibility for war and how the old feudal thinking kills us all.” Though not a hit for Sainte-Marie, it was a year later for British singer Donovan, and it was popular as a peace anthem with the anti-Vietnam War movement. The album also featured: “Cod’ine,” which Sainte-Marie wrote after becoming addicted to codeine while recovering from bronchitis (the song was later covered by Janis Joplin); and “Now That the Buffalo’s Gone,” a protest song about the confiscation of Indigenous peoples’ land. The album earned her the Best New Artist honour from Billboard magazine. Sainte-Marie released 13 more albums through the 1960s and 1970s. Her sound evolved from acoustic folk to incorporate rock, country and electronic-based music with a wider range of instrumentation accompanying her vibrato voice. Her 1969 release Illuminations was the first quadraphonic electronic vocal album ever recorded, and also featured early synthesizers. 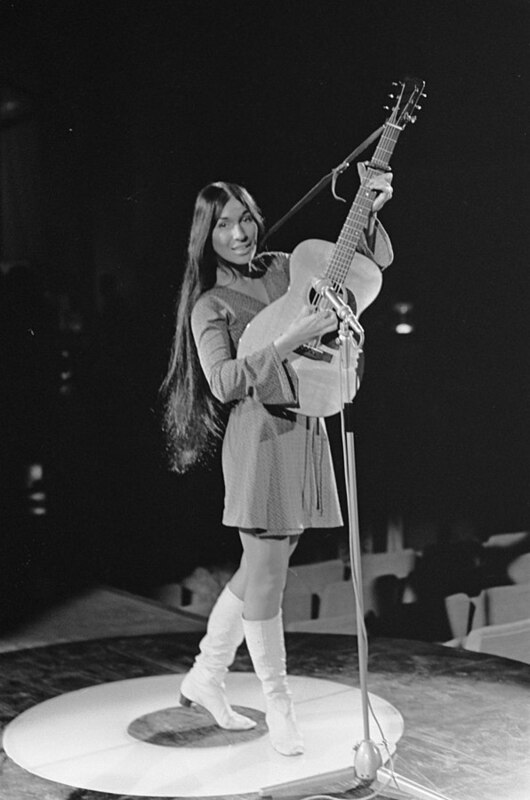 Many of her early songs were included in The Buffy Sainte-Marie Song Book (Grosset & Dunlap, 1971). In 1972 she released Moonshot, the first of four albums she recorded with Nashville-based producer Norbert Putnam (Jimmy Buffet, Joan Baez, John Hiatt), including Quiet Places (1973), Buffy (1974) and Changing Woman (1975). Her version of Townes Van Zandt’s “Mister Can't You See,” from Moonshot, was a Top 40 hit in the US in 1972. Following the release of Sweet America in 1976, Sainte-Marie took a 16-year sabbatical from recording to raise her son, Dakota Starblanket Wolfchild. She continued to perform occasional concerts in Canada and Europe, and also toured First Nations reserves and towns in Western Canada and Ontario. She sang with the Regina Symphony Orchestra under John Kim Bell, with the National Arts Centre Orchestra and at festivals, including at the Elora Festival in 1997. Sainte-Marie’s strong stance on Indigenous issues and against the Vietnam War made her unpopular with the Johnson and Nixon administrations in the United States. As a result, her music was blacklisted from radio stations and held back from reaching a wider audience, as she discovered after seeing her FBI files in the early 1980s. Her many songs about Indigenous peoples and issues include “Starwalker,” “Bury My Heart at Wounded Knee,” “No No Keshagesh,” “Generation,” “Cho Cho Fire,” “Ke Sakihitin Awasis,” “Still This Love Goes On,” “Eagle Man/Changing Woman,” “Native North American Child,” “Now That the Buffalo's Gone,” “Soldier Blue” and “My Country 'Tis of Thy People You're Dying.” She rewrote the latter song to reflect specifically Canadian issues and sang it in Ottawa at the closing day of Truth and Reconciliation Commission in 2015. Although mostly known for her music, in the late 1960s Sainte-Marie became involved in both education and film. When she appeared in a 1968 episode of the NBC TV series The Virginian, she insisted that Indigenous actors be cast in all the Indigenous parts. In 1969, she founded her Nihewan Foundation partly to overcome the stereotyping of Indigenous peoples in public media and education. Sainte-Marie joined the cast of the popular children’s television show Sesame Street in late-1975 and appeared regularly on the program until 1980. She appeared on several CBC Radio and TV shows, including: Superspecial (1978), Pascan: Pow Wow (1982), and The Many Moods of Buffy Sainte-Marie (1983). She also composed the score for the film Spirit of the Wind (1979), the theme song for the CBC TV series Spirit Bay (1984–86), and several other film scores in the US. Sainte-Marie also wrote and performed the music for the film Where the Spirit Lives (1989), which dealt with Indigenous children being abducted and forced into residential schools. She voiced the Cheyenne character, Kate Bighead, in the TV movie Son of the Morning Star (1991), which told the Indigenous side of the Battle of the Little Bighorn, and appeared with Graham Greene in the 1993 TV Movie The Broken Chain. Her 1996 variety special, Up Where We Belong, won her a Gemini Award. Following the birth of her son in 1976, Sainte-Marie focused on raising her son and limited her work to scoring films, performing occasional concerts, composing and painting in her home studio, and writing curriculum for her Nihewan Foundation’s main educational initiative, the Cradleboard Teaching Project. She was a pioneer in her use of Macintosh computers in making music and also uses them in her digital art. Her paintings have been exhibited in museums and galleries across North America. She resumed her recording career in 1992 with the release of Coincidence and Likely Stories, which became the first album to be delivered digitally via the fledgling Internet. Recorded at her home in Hawaii, she sent it via dialup modem to the London studio of producer Chris Birkett (Sinéad O'Connor, Steve Earle, The Proclaimers), with whom she would make four more albums. Coincidence and Likely Stories features both electronic backings and traditional Aboriginal chants, and won Sainte-Marie a Charles de Gaulle Award in France for Best International Artist. She followed that pioneering effort with Up Where We Belong (1996), a collection of new and previously recorded songs that combined elements of pop, protest and powwow music. It received the Juno Award for Best Music of Aboriginal Canada Recording in 1997. Sainte-Marie’s lobbying had been instrumental in the creation of that award, which was first presented in 1994. Between 1997 and 2009, Sainte-Marie dedicated her time and money to the Cradleboard Teaching Project. She travelled extensively and did not record, though she did perform during this time in Sweden, Denmark and France, and appeared at the Ottawa Folk Festival in 2002. In 2005, her signature song, “Universal Soldier,” was inducted into the Canadian Songwriters Hall of Fame. Following Vanguard's release of the compilation album The Best of the Vanguard Years (2003), Buffy independently released Running for the Drum (2008), a collection of 12 new songs of love, rock, protest and Aboriginal country. It featured American blues musician Taj Mahal on piano and won the 2009 Juno Award for Aboriginal Recording of the Year, as well as four Canadian Aboriginal Music Awards. Buffy Sainte-Marie: A Multimedia Life (2006), an hour-long documentary featuring archival footage and interviews with several well-known musicians, was also nominated for a 2009 Juno Award for Music DVD of the Year. In 2012, Blair Stonechild’s award-winning biography, Buffy Sainte-Marie: It’s My Way, was published by Fifth House. Sainte-Marie has lived in Hawaii for many years but continues to record and tour well into her seventies. Her album Power in the Blood (2015), recorded on her Gypsy Boy label and distributed by True North Records, won the 2015 Polaris Music Prize as well as 2016 Juno Awards for Aboriginal Album and Contemporary Roots Album of the Year. Sainte-Marie was also featured on the single re-mix of her song “Working for the Government” by fellow Polaris nominee A Tribe Called Red, and received the Spirit of Americana/Free Speech in Music Award from the Americana Music Association in 2015. Sainte-Marie’s 19th album, Medicine Songs (2017), features a mix of new material, such as “You Got to Run (Spirit of the Wind),” a collaboration with Tanya Tagaq, and re-recorded older songs, including “Starwalker,” “Little Wheel Spin and Spin” and “Bury My Heart at Wounded Knee.” The album drew positive reviews, with NOW magazine’s Michael Rancic observing, “Another artist might show signs of disappointment or uncertainty when faced with the notion that not much has changed in half a century, but on Medicine Songs, in the face of the unchanging nature of the oppression she’s expressed through her music, Buffy Sainte-Marie has chosen to be just as determined, unflinching and constant in her own art.” Medicine Songs went on to win the 2018 Juno Award for Indigenous Music Album of the Year. Sainte-Marie has dedicated much of her life to education. After graduating with honours in Oriental philosophy and education from the University of Massachusetts, Amherst in 1963, she obtained an honorary doctorate in fine arts from the same school in 1983. She has taught music and digital art at the Saskatchewan Federated Indian College, York University, Evergreen State College in Washington and the Institute for American Indian Arts in New Mexico. She founded the philanthropic non-profit fund Nihewan Foundation for Native American Education in 1969, and in 1996 she created the Cradleboard Teaching Project, which facilitates communication among Aboriginal and mainstream school children through the use of computer networking. Sainte-Marie used her multimedia skills to create a core curriculum based in Native American cultural perspectives, and produced, directed and appeared in Cradleboard’s interactive multimedia CD-ROM, Science: Through Native American Eyes. She has also been a spokesperson for the United Nations Educational, Scientific and Cultural Organization (UNESCO), and gives speaking engagements and presentations about her career and philanthropic projects. Sainte-Marie’s fearless social commentary and advocating for Indigenous issues, both in her songs and in her life, have earned her many devoted fans and the respect of her musical peers. Many of her songs, from “Universal Soldier” to “Until It’s Time For You To Go” and “A Soulful Shade of Blue,” have been covered by hundreds of artists including Barbra Streisand, Neil Diamond, Jim Croce, Elvis Presley, Glen Campbell, Cher, Bobby Darin, Indigo Girls, and Neko Case (see The New Pornographers). Sainte-Marie has been an inspiration to many, particularly Indigenous and female artists, and has always endeavoured to evolve creatively through her choice of instrumentation and recording technology. Illuminations: A Biography of Buffy Sainte-MarieRead this extensive profile of Sainte-Marie from the Los Angeles Review of Books. “Universal Soldier”Buffy Sainte-Marie performs “Universal Soldier” and explains how it came to be. Polaris 2015 Winner Buffy Sainte-MarieRead this 2015 profile of Sainte-Marie from Maclean’s magazine. Official WebsiteVisit Buffy Sainte-Marie’s official website for news, touring info and more. George Stroumboulopoulos TonightBuffy Sainte-Marie discusses her life and career with CBC TV’s George Stroumboulopoulos.